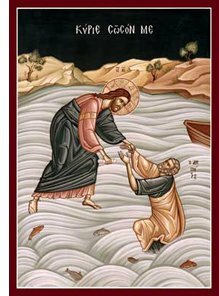 There is a moment in Mark’s gospel (Mark 9) where a desperate father brings his son to Jesus for healing and, when Jesus says all things are possible if you believe, the father says “I believe, help my unbelief.” I suspect we can all sympathise and identify with that man’s dilemma: do we believe? How can we know? Be certain? Is the voice of doubt and unbelief perched on our shoulders whispering? Each time we say the creed, just that first phrase “I believe in God…” is there a tremor of uncertainty, a moment in which we engage with the question “what do I mean”, and “what if this is true”? In that brief moment our world begins to shift, the paradigms by which we see ‘reality’, tilt and something new emerges. So, if Mark reports the situation accurately, what changes for the father when his son is healed? Belief is not just a hypothesis but a paradigm shifting moment in which he sees Jesus differently. Can we imagine how we might respond to such a moment in our lives? I am confident that we too would experience a paradigm shift and believe! But such a paradigm shifting belief is not founded on intellectual conviction or scientific comprehension – for we don’t have that measure of control – but something else, something that Paul describes in terms of the heart. He says “one believes with the heart.” One believes with the heart! Take note, we are so accustomed to think of belief as a matter of the mind and intellectual conviction, but instead Paul locates the core of belief in the heart! In saying that, he follows a consistent thread through the OT scriptures where the heart is our spiritual, intellectual, moral and ethical centre. It shapes our fundamental disposition; and Proverbs accordingly counsels us “keep your heart with all vigilance, for from it flow the springs of life.” (Prov. 4:23) Much closer to our own time we find similar conviction in Blasé Pascal, who famously noted "The heart has its reasons which reason knows nothing of... We know the truth not only by the reason, but by the heart." So I encourage you to read our gospel this morning not merely with the critical faculties but also with the warmth and insight of your imagination. Remember the context: the disciples have witnessed the spectacular miracle of the Feeding of the Five Thousand and have been separated from Jesus who went off to pray while they launched off into the Sea of Galilee. These are experienced fisherman, used to weather, boats and the ways of the sea; but nothing in their life has prepared them for the appearance of Jesus walking on the water toward them. Can we believe the gospel here? Is the gospel presenting a symbolic and metaphorical statement about the nature of God or is this a literal account of something that happened? If it is a true record, what are its implications for us? Is this a moment when the disciples’ understanding of reality and the world endures a radical paradigm shift and adjusts to a new understanding of faith and of Jesus? He knows this is madness, sheer folly. We do not walk on water. And yet against every human instinct he steps out of the boat and begins to walk toward Jesus. Maybe like a tightrope walker his eyes focussed ahead to his destination and all his thoughts keeping at bay the thought of the depths beneath him until, until the moment he is distracted and,overwhelmed by fear, he sinks into the dark waters. “Lord save me!” That is the moment when we are told that Jesus immediately reached out his hand and caught him saying “You of little faith, why did you doubt?” As Peter finds himself held and safe, what might have gone through his mind; or is it rather what overwhelmed his heart? He was safe in the abyss, in the dark waters. All of us may recognise something of ourselves in Peter and something of what it means to be people of little faith. We may say, Lord it is human to doubt. We want to believe but help us with our unbelief.